انجمن نجات ايران : Full transcript: Vice President Mike Pence on "CBS This Morning"
Full transcript: Vice President Mike Pence on "CBS This Morning"
"Face the Nation" moderator Margaret Brennan sat down early Thursday morning with Vice President Mike Pence for "CBS This Morning." Hours before, the vice president had been among those at Joint Base Andrews to greet three Americans freed from North Korea: Kim Dong Chul, Kim Hak Song, and Tony Kim. 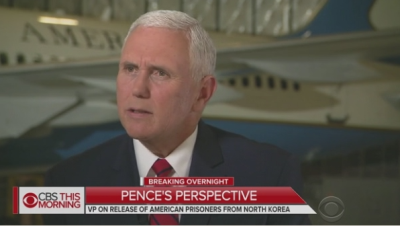 In the interview, Pence discussed the upcoming summit between President Trump and North Korean leader Kim Jong Un, UVA student Otto Warmbier, and the United States withdrawal from the Iran nuclear deal. Below is the full transcript of their conversation. Some of Brennan's interview aired Thursday on "CBS This Morning." MARGARET BRENNAN: Thank you very much, Mr. Vice President. VICE PRESIDENT MIKE PENCE: You bet. MARGARET BRENNAN: What condition are these prisoners in? And what do we know about what happened to them in captivity? VICE PRESIDENT MIKE PENCE: Well, they're receiving detailed medical attention, and have since they were wheels up from North Korea. But all of them were in such good spirits. To be able to have an opportunity to visit with them on the tarmac after the President and First Lady brought them out of the plane was deeply moving to Karen and me. And to have a few words with them, to hear their expressions of support for the president, their gratitude to the country, their gratitude for the prayers of the American people, I'll remember the rest of my life. But, you know, it really was a moment, Margaret, that I believe is a result of a change in policy and a change in leadership here in the United States of America. It--it was just a few days after the inauguration in 2017 that President Trump initiated a policy of-- of abandoning the era of strategic patience with North Korea and adopting a new policy to bring economic and diplomatic pressure to bear to achieve what the world had failed to achieve for more than two decades: the denuclearization of the Korean peninsula. And tonight, on the tarmac at Andrews Air Force Base, we-- I think we saw a hopeful sign that this time it might be different. And we are-- we very much appreciate the statements and the efforts that Kim Jong-un has made so far to move us toward the path to peace. MARGARET BRENNAN: And you've been involved behind the scenes in strategizing for this summit between Kim Jong-un and President Trump. What does the release actually signify to you, though, about Kim's willingness to negotiate away his nuclear arsenal? VICE PRESIDENT MIKE PENCE: Well when you look at the agreed framework of the Clinton administration, when you look at the six-party talks of the Bush administration, there was a fairly consistent pattern, Margaret, of when negotiations for denuclearization of North Korea failed in the past. And that was that the parties came together, promises were made, and then promises were broken. But-- but the promises weren't made by North Korea until there were concessions, until there were resources made available. MARGARET BRENNAN: --this summit as a concession? VICE PRESIDENT MIKE PENCE: Well what I see is when--when the South Koreans came with the request for a meeting, and said that-- that Kim Jong-un had said he was prepared to suspend ballistic missile testing, suspend nuclear testing, not object to American military exercises, and was requesting a summit. I was sitting next to the president when, virtually on the spot, he said, "Yes. We'll do it." VICE PRESIDENT MIKE PENCE: --hope this may be different. MARGARET BRENNAN: You've been speaking with the Secretary of State who has been in the ground in Pyongyang. VICE PRESIDENT MIKE PENCE: I have. MARGARET BRENNAN: In this meeting, were there any new concessions made, any promises made about what Kim will actually do with his nuclear program? VICE PRESIDENT MIKE PENCE: What Kim Jong-un has said publicly and in discussions is that he is prepared-- he is prepared-- to negotiate to achieve complete denuclearization of the Korean peninsula. Those words are important, but we'll see what they mean. And I do believe that, when the summit comes about, in the not-distant future, that President Trump will go in with the attitude of trying to determine, you know, what the intentions of the North Koreans are. But in the same moment, he'll be making very clear that-- that we're not going to make the mistakes of the past. That--that the United States of America will stay on the path that brought us to this point. President Trump changed the direction of North Korea, changed the entire direction of the Asian Pacific with regard to this threat when he abandoned strategic patience, brought our allies together, brought China in, in an unprecedented way. And we believe all of that in combination has brought us to the point where we have a real opportunity for a breakthrough. But the President will--he'll assess that at the moment in the time. But we really believe it's significant. Not only is it--it's a great day in America to see three Americans freed from captivity in North Korea. But - but we also think it continues to support that this-- this may be a real opportunity for a historic peace. VICE PRESIDENT MIKE PENCE: I did. MARGARET BRENNAN: --UVA student who wasn't so fortunate and died shortly after he was released from captivity. What did you say to his parents when you spoke to him (sic) yesterday? VICE PRESIDENT MIKE PENCE: Well President Trump called the Warmbiers over the weekend. And when news broke that the Secretary of State was coming home with our three Americans I felt compelled to call them as well. And simply let them know that, while, while we we receive this news with joy, that that Otto was on all of our hearts. And their family was in our prayers. I mean,we-- we got Otto home last year, but it wasn't soon enough, and we lost him. And-- and their family has-- has been so brave and so courageous standing up for the truth of what happened to their son. But the-- but the need for real progress on the Korean peninsula, as you know, Fred Warmbier traveled with us when we went to the Olympics. He met with defectors. He-- he has taken the pain and suffering and loss of that family and they have turned it into-- a platform to advocate for justice on the Korean peninsula. And they have our deep respect. MARGARET BRENNAN: There are also other families suffering. In Iran, at least four American prisoners are still being held there. VICE PRESIDENT MIKE PENCE: Yes, that's right. MARGARET BRENNAN: One of their family members was at the White House yesterday. Is the Trump Administration open to a prisoner swap? MARGARET BRENNAN: And that means--talking to Iran right now about doing that? VICE PRESIDENT MIKE PENCE: Well, I think we sent a pretty strong message to Iran this week when the President made the decision to withdraw from their Iran nuclear deal. MARGARET BRENNAN: And that's why the families are worried that their family members may be held hostage now to this diplomacy that's been torn up. VICE PRESIDENT MIKE PENCE: Well, we actually believe that, that by withdrawing from the Iran nuclear deal, we've not with-- we've not stepped back from leadership in the region. But rather, President Trump is providing new and renewed leadership. MARGARET BRENNAN: But why not handle the prisoner issue before that? MARGARET BRENNAN: But nothing on the prisoners? VICE PRESIDENT MIKE PENCE: --the possibility of a new deal which may create opportunities for not only addressing issue of Americans that are detained in Iran, but also checking the extraordinary malign influence and support for terrorism that Iran continues to propagate across the region. MARGARET BRENNAN: Overnight, Iranian forces fired on Israeli troops. VICE PRESIDENT MIKE PENCE: They did. MARGARET BRENNAN: Israel has now carried out air strikes. Did you expect that exiting the deal would have this kind of escalation? VICE PRESIDENT MIKE PENCE: Well, we've - we've been anticipating the potential for some Iranian reaction since air strikes that took place a couple of weeks ago against Iranian sites in Syria. And we're monitoring it very closely. We stand by Israel's right of self-defense to protect its nation, its people, and its sovereignty. But make no mistake about it, the Iran nuclear deal that allowed 150 billion dollars to be returned, 1.8 billion dollars in cash, the - the fact that the deal didn't check the aggressive influence of Iran across the region is exactly why Iran is in Syria. It's exactly why you have Iranian forces and Iranian missiles that have positioned in Syria as that nation's been swept up into a bloody civil war. MARGARET BRENNAN: --diplomacy with North Korea? VICE PRESIDENT MIKE PENCE: -- that will check - that will check the malign activities of Iran and prevent the kind of violence that we saw in the last 24 hours. MARGARET BRENNAN: And you don't think that hurts your diplomacy with North Korea? VICE PRESIDENT MIKE PENCE: President Trump believes in peace through strength. And by withdrawing from the Iran nuclear deal, he's made it clear to the world stage that we will not enter into a deeply flawed agreement that does not achieve the objectives that we stated. MARGARET BRENNAN: But not America's word. VICE PRESIDENT MIKE PENCE: - but the other is - the other is I think now the message they'll receive is, if we do a deal for the de-nuclearization of the Korean peninsula, that not only will the President keep his word, but he is going to hold out for a deal that really achieves the objective that has eluded the world for more than a quarter of a century. And that is peace on the peninsula, no more nuclear weapons. And - and no more threatening of our allies and neighbors in the Asia Pacific. MARGARET BRENNAN: I'm being given a wrap here. Mr. Vice President, thank you for your time. VICE PRESIDENT MIKE PENCE: Thank you, Margaret. Appreciate you being here. مطلبی از اصفهان -ا سماعیل در آتش! روسیه، رژیم را از سوریه بیرون می‌کند!